Each month on Perfect Pieces, we feature a single item from our stock on the home page, at a specially-discounted price that will only be available for a limited period. 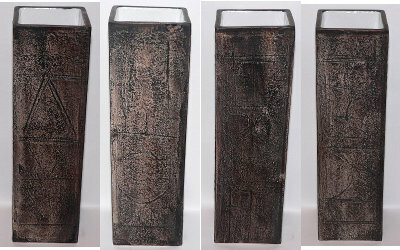 This month’s featured item is an early Troika St Ives rectangular vase. This 8″ vase dates from Troika’s early period, when the pottery was based at Cornwall’s artistic hub, St Ives, and was handpainted by one of Troika’s earliest decorators, Sylvia Vallance. Vallance only worked at the pottery from 1967-69, enabling us to date this vase quite precisely. This vase is quite unusual because it combines a popular shape — the rectangular vase — which was used right through the 1970s, with a much earlier style of decoration. The brown-black glaze used by Sylvia Vallance is a hallmark of early Troika that fell out of use soon after this piece was made, and while the body of the vase is patterned, it is much less three-dimensional than later examples, which often had substantial moulded decoration. The vase offers a relatively rare opportunity to buy a good quality early piece of Troika that provides an interesting contrast with the more common and boldly-painted textured pieces. Pieces made during Troika’s St Ives period (1963-1970) are comparatively rare, making them an interesting addition to any Troika collection. 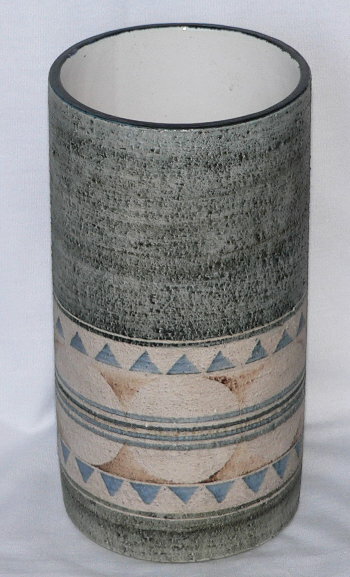 A Troika St Ives period rectangular vase, dating 1967-69 and decorated by Sylvia Vallance. This entry was posted in Troika and tagged rectangular vase, Sylvia Vallance, Troika on October 1, 2013 by Perfect Pieces. We’ve recently added a superb Troika Pottery Marmalade vase to the Perfect Pieces Troika Pottery section. This Troika vase is a marmalade vase with a deep blue glazed rounded top and very striking design. We have a wide range of Troika Pottery pieces for sale including Troika Coffin vases, Troika cube vases and early Troika St Ives pieces. If you don’t see anything you’re after then simply let us know what it is you’re looking for and we’ll see if we can help. This entry was posted in New Stock and tagged Alison Brigden, Cornwall, Studio Pottery, Troika, Troika Marmalade, Troika Pottery on April 14, 2012 by Perfect Pieces. Decorated by Penny Black this is a very striking Troika Pottery vase with textured designs on the front and back and contrasting blue glazed sides. This vase has a minimalist pattern based on the circle motif used on some of the early Troika pieces. The abstract design has been highlighted with the use of contrasting colours making it overall a very striking piece of Troika from the c1970’s. We have a wide range of Troika Pottery for sale including early St Ives pieces as well as some more unusual pieces such as Troika Egg Cups and Troika ashtrays. This entry was posted in New Stock and tagged Cornwall, Penny Black, Studio Pottery, Troika, Troika Pottery on February 27, 2012 by Perfect Pieces. This entry was posted in Troika and tagged Anne Lewis, Honor Curtis, St Ives, Sylvia Vallence, Troika, Troika Marmalade Vase, Troika Pottery, Troika Rectangular Vase, Troika Wheel Vase on November 8, 2011 by Perfect Pieces. We have a wide range of Troika Pottery for sale including a lovely Troika Coffin vase, a large Troika Cylinder vase and a Troika Pottery Marmalade vase decorated by Judith Illsley. Judith Illsley was married to one of the founders of Troika pottery, Leslie Illsley, and only worked as a decorator at Troika for a very short time in late 1980! This entry was posted in New Stock and tagged Judith Illsley, Newlyn, St Ives, Studio Pottery, Sylvia Vallence, Troika, Troika Coffin, Troika Cylinder, Troika Marmalade, Troika Pottery, Troika Rectangular Vase, Troika St Ives on October 13, 2011 by Perfect Pieces.